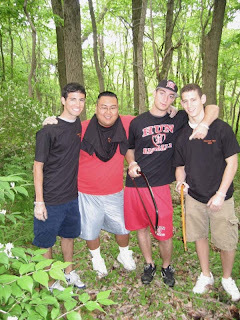 Princeton Cares, a local nonprofit, organized a workday at Mountain Lakes on Sunday, May 17. Ten high schoolers from Princeton Day School, Hun and Princeton High School, along with two parents and a sibling, cleared invasive species and planted native bottlebrush grass near the Mountain Lakes House. This was stop #1 in a whole day of good deeds by the nonprofit volunteers. Friends of Princeton Open Space and the Whole Earth Center are sponsoring a small plant sale at Whole Earth Center on Sunday, June 1 at 2pm. 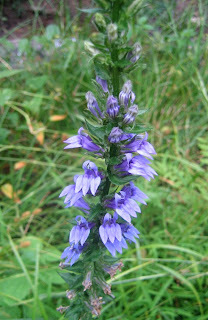 Species available: cardinal flower, great lobelia, black-eyed susan, mistflower, serviceberry, swamp azalea, red chokeberry, Virginia sweetspire and sweet pepperbush. Prices range from $3-$12. 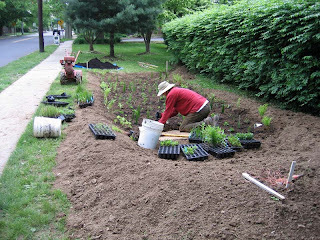 Around 3 or so, we'll take a short walk to visit native gardens that have been installed just a block away from Whole Earth Center, in Harrison Street Park and at the Senior Center on Harrison Street. The gardens aren't blooming yet, but we'll look at their placement, design, and how the plants are doing. One of the goals of the native plant workshops is to create demo gardens around town, and these are two fine examples. Whole Earth Center will provide refreshments. People often think of evergreen trees and shrubs as static, but they too go through seasonal transformations. 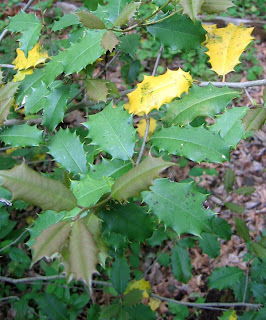 An American Holly demonstrates this well. The photo shows three years worth of leaves. This spring's new leaves are olive green, last year's leaves are bright green, and the two year old leaves (yellow) are in the process of being cast overboard. The tree might look unhealthy, but the shedding of two-year-old leaves is as natural as when deciduous trees drop their one-year-old leaves in the fall. Sometimes you just have to seize the day, take an idea and run with it. Borough resident Curtis Helm called me one day with an idea for a rainwater garden in front of the Senior Center at Spruce Circle. We found a nice sunny spot that could be fed by water from the nearby roofs. Curtis drew up a design and plant list, I met with Scott Parsens, head of the Princeton Housing Authority, who then got the go-ahead from the housing board. A day later, Curtis had already picked up plants donated by Pinelands Nursery. 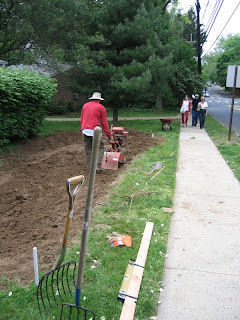 This past weekend, serenaded by traffic noise on Harrison Street, Curtis broke new ground, so to speak, using his trusty old TroyBuilt roto tiller to remove the sod. We then recontoured the ground with shovels, digging out dirt and building a berm to catch the runoff from nearby downspouts. The next day Curtis planted a host of native wildflowers, rushes and ferns--Cardinal Flower, JoePyeWeed, Sunflower, Swamp Milkweed, Smooth Rush, Sensitive Fern to name a few. Switchgrass and Virginia Sweetspire will be planted on the berms. Some woodchip mulch around the edges, a trimming of the shrubs, signs to explain it all to passersby, and the raingarden's birth will be complete. Rainwater enters from the upper and lower righthand corners, accumulates to six inches or so, then seeps in over several hours, providing the plants with an underground reservoir of water to feed on as their roots grow. I like to think of this as "sunken bed" gardening, as opposed to raised beds. Sometimes Mother Nature can fool those who don't look closely enough. 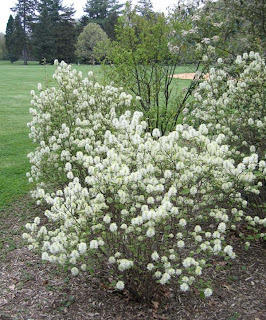 It was recently pointed out to me that the large, aggressive shrub in our Princeton, NJ preserves that I was happily calling Aronia arbutifolia is in fact an exotic invasive, Photinia villosa. It did seem strange that a species I had had no luck with growing in the past could be doing so well and acting strangely dominant and exclusionary in the local wilds. A quick look in Michael Dir's hefty Manual of Woody Landscape Plants showed distinct differences. 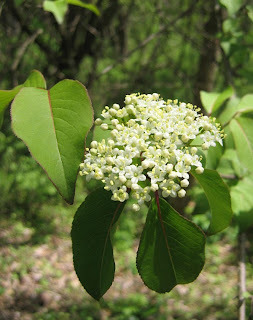 They have similar flowers--both are in the rose family--but native Red Chokeberry blooms a few weeks earlier, with Photinia blossums opening in mid to late May. The petiole (segment connecting leaf to stem) is 1/8th inch on Photinia, longer on Chokeberry. The leaf venation pattern too is different. 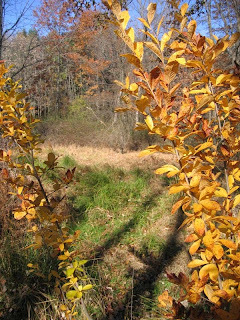 Fall color is tan, while Red Chokeberry is said to be red. Photinia also grows much larger, reaching 15 feet or more. Results from an internet search suggest that I'm not the only one who has been unaware. The USDA government site shows it growing in three states plus DC, but not in NJ. A University of Florida site says it has little invasive potential. 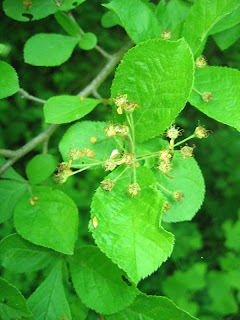 Thanks to Jared Rosenbaum, of D&R Greenway, for alerting me to the presence of this invasive. 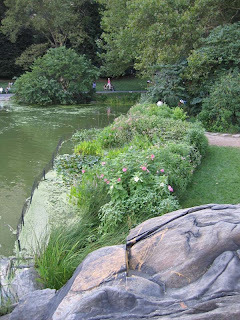 In New York's Central Park, many of the lake edges have been planted with native wildflowers. This is the first year we've tried it at Princeton's "Central Park", a.k.a. Mountain Lakes Preserve. It's not as easy as it might seem. Years ago the StonyBrook Watershed Association tried it. I've been told the geese and deer watched from afar as the plants were installed, then moved in after all was planted and munched to their hearts' content. 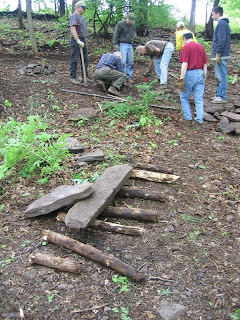 This past October, our Princeton Native Plant Workshop group planted the edge of the upper Mountain lake with native wildflowers grown from seed (see Oct '07 post). It was a fun session, and lots of plants went in, but they suffered from frost heave over the winter. 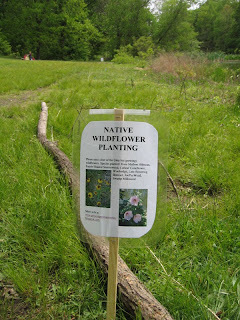 A number of the plants survived, however, and this spring I added some more from the Mountain Lakes greenhouse--cutleaf coneflower, rose mallow Hibiscus, woolsedge, swamp milkweed--and added some visual cues and signage to help prevent inadvertent mowing and trampling by passers by. Last year, one lone Late-Flowering Boneset was all the lakefront had to offer to pollinators in July and August. With some luck, they'll have more faire to sustain them this summer. 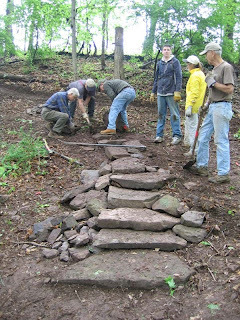 A volunteer crew from the NJ Trail Association came to Mountain Lakes Preserve this past Saturday to add steps to a steep section of the Farmview Trail that overlooks neighboring Coventry Farm. Note the Egyptian method of transporting heavy stones found nearby along the hillside. Friends of Princeton Open Space board member Ted Thomas, on the right in the second photo, coordinated the session. A big thank you to NJTA for their help. 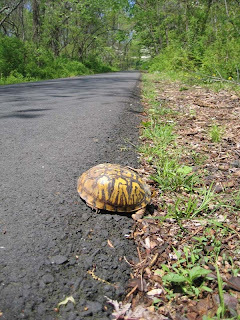 If you ever want to download maps of nature trails, including those in Princeton, go to their website at www.njtrails.org. We'll talk the talk and walk the walk this Sunday at 3pm, when the Friends of Princeton Open Space has its annual meeting at Mountain Lakes House. The very brief meeting will be followed by a talk by international climate change expert Stephen Pacala, who is a professor at Princeton University and Co-Director of Princeton's Carbon Mitigation Initiative. There will be some refreshments after the talk, and then I'll lead a nature walk through Mountain Lakes and the meadows of Tusculum, stopping by our habitat restoration project just upstream of the lakes. If you're planning to come, please call 921 2772 to rsvp. All are welcome. Mountain Lakes House is at the end of the long driveway at 57 Mountain Ave. in Princeton. 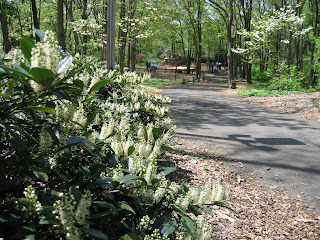 One of the more popular walks for Princeton residents, of all sorts, is the driveway leading up to Mountain Lakes House. For anyone not ready to venture onto the trails around the lakes, up into the boulder fields of Witherspoon Woods, or over to the meadows of Tusculum, the driveway provides a broad, dependably dry passage into nature. 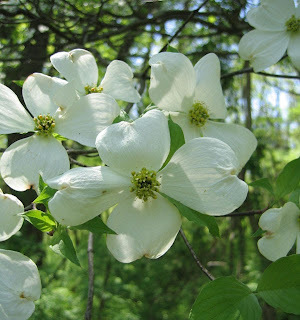 Right now, the dogwoods are showing the rest of the wooded world what elegance is all about. If you look down along the roadsides, you'll see some other white blooms--spring beauties and, alas, the highly invasive garlic mustard. 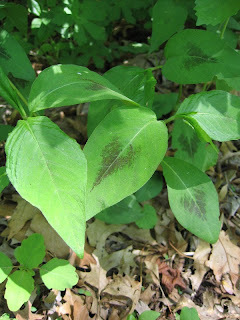 Less ubiquitous is the native Virginia Knotweed (photo), which has a dark thumbprint on its leaf. 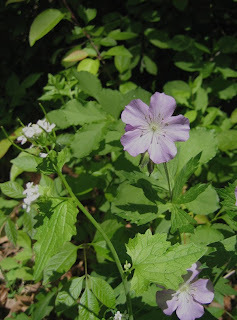 There's even one small patch of native wild geranium along the edge of the driveway, offering a bit of alternative color in this time of flower white and leaf green. 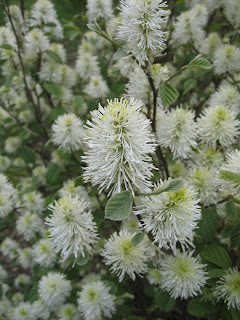 There's an impressive grouping of Fothergilla, a shrub native to the southeast US, near the ballfield at Marquand Park. In shady locations, it's less opulent with the blooms, but its leaves still turn a brilliant orange in the fall. English Laurel is in full bloom at Pettoranello Gardens. Though not native, it has not proven invasive, and can be a sturdy evergreen for landscaping. 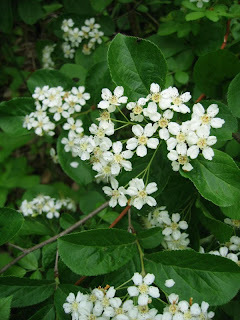 Blackhaw Viburnum is a common large shrub growing wild at Mountain Lakes Preserve, just down the long driveway from Pettoranello Gardens. The flowers are often 20 feet up, and are harder to see now that the woods is greening up.